Although I wouldn't call myself a "film critic", I like to pretend that I know a little bit about movies. If nothing else, I've spent countless hours in the theater or at home watching films. That has to count for something, right? With that feeling in mind, I decided it was time to fill in yet another gap in my film history. Every 10 years, the acclaimed British film magazine Sight and Sound releases the results of a poll asking experts to name the greatest films of all time. The last one took place in 2002, so I expect that a new version will happen this year. Reviewing the 2002 poll, there are three movies that I haven't seen: Tokyo Story, Sunrise: A Song of Two Humans, and The Rules of the Game. Over the next three weeks, I'll be checking out these films for the first time. For the inaugural screening, I've chosen a movie that has sat in my DVR at two different points in the past, Tokyo Story. If I don't take this leap, I'm guessing this hole will remain for a long time. Shukishi (Chishû Ryû) and Tomi Hirayama (Chieko Higashiyama) take the train from their hometown of Onomichi to visit their adult children in Tokyo. The elderly couple meet up with the families of their son Koichi (Sô Yamamura) and daughter Shige (Haruko Sugimura) but aren't greeted with open arms. Instead, they're treated like a nuisance and sent to a resort to keep from interfering with daily life. 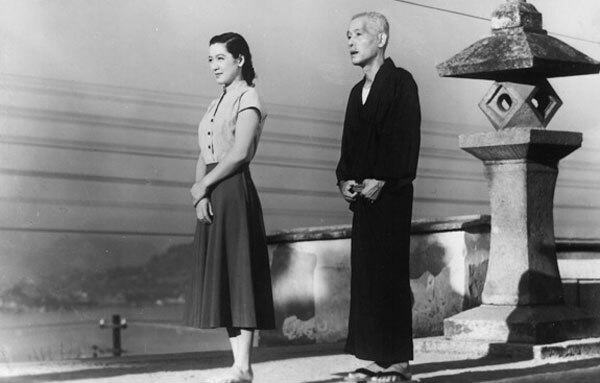 An exception is Noriko (Setsuko Hara), the wife of the Hirayama's son who died in the war. She treats them with respect and is actually happy to see the couple. When Tomi's health becomes a concern, all the kids (including their other son Keiso) return home. However, even this somber reunion can't solve the kids' general indifference towards their struggling parents. Who needs family when you're in the big city? 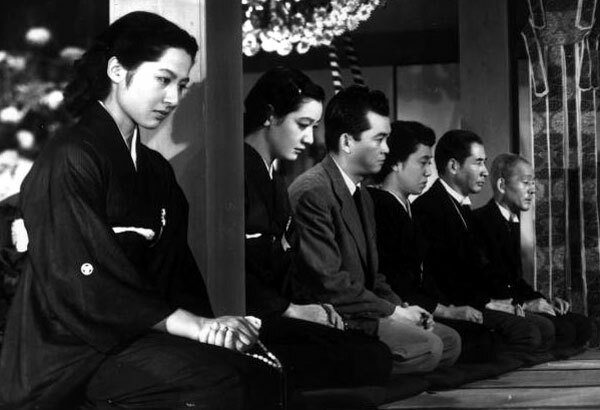 The primary reason for Tokyo Story's consideration as a classic film is the legendary Yasujirô Ozu, who directed more than 50 films during his 35-year career. His other major works include Floating Weeds and An Autumn Afternoon, two of his late-career movies. Ozu is one of Japan's most renowned filmmakers and has a unique style involving a static camera and original transitions. The other major reason is the subject matter, which tackles relationships among family members in a complex manner. The characters are distinctively Japanese and don't talk about their feelings, especially those from the older generation. Although the subject might seem conventional, Ozu's low-key approach sidesteps the typical melodramatic trappings and lets the audience figure out the major issues. This style requires a lot of attention, but the story's lasting effect has surprising power and helps to explain why it's listed among the greatest films of all time. 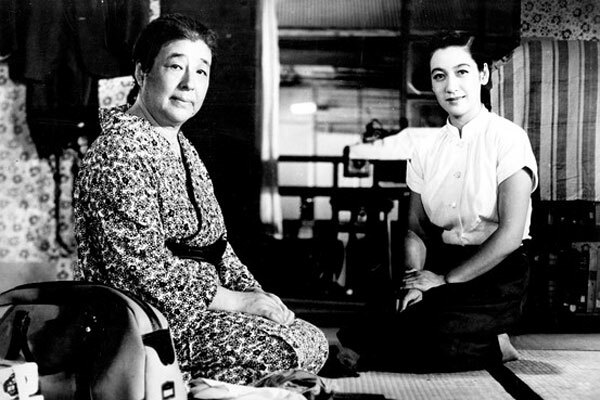 Easily the strongest part of Tokyo Story is the characters' complexity, especially Shukishi and Tomi. They seem like simpletons during the early scenes, but hints arise that reveal they have a much better understanding of their children. When he explains how his kids are "better than average", it's true but still a sad reflection on the treatment. For example, Koichi may be a successful doctor, but he's a lifeless guy who cares more for his work than his family. By society's terms, he's doing well if you only consider professional status. An even nastier character is Shige, who's mean to everyone, especially her parents. She talks to them like kids and even treats her mother's illness like a nuisance. These characters might be despicable at times, but the actors never strike a wrong note. The final scenes in Onomichi are telling because they reveal cracks in the armor. When Shige discovers her mother's fate, she weeps openly, but the dismissive wall quickly returns. One of the most interesting figures is Noriko, who treats Shukishi and Tomi better than the others. She's not a blood relative but uses a friendly demeanor to disguise her guilt. She's still young and attractive, but the negative effects of her troubled marriage remain. She's the most likable character from Tokyo and represents a counterpoint to illuminate the others' indifference. Ozu has an original style that can be off-putting if you're expecting an active camera. The static shots and intimate approach to the characters are unsettling at times because there's nowhere for us to hide. When Shige actually tells her siblings that she wished her father had died first, the camera doesn't cut away for a quick reaction. Known as the "tatami shot", Ozu's approach keeps the camera low, which places the audience right inside the rooms. There are numerous shots of faces that betray only a hint of the emotions that reside within. Chieko Higashiyama is especially good at revealing the hints of dismay inside Tomi but keeping a smile on her face. 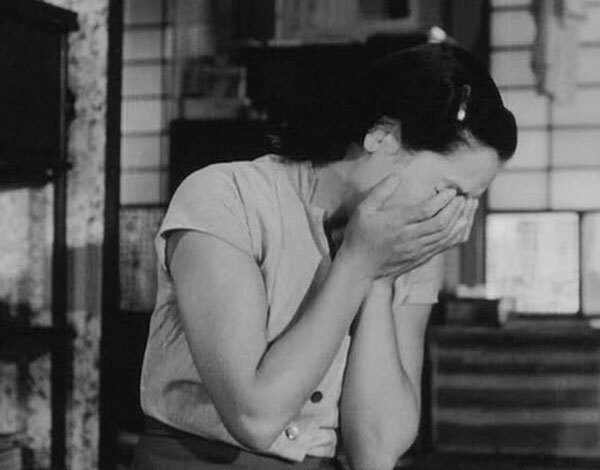 Ozu captures these subtle looks, which add to our emotional investment in the story. We realize that the barbs hit home even when the parents act like everything is fine. I will say that Ozu's approach does create an extremely deliberate pace that might lose some viewers. There's a reason that he's not as much of a household name as Kurosawa. There are plenty of rewards within this film if you're willing to give it a chance. There are too many interesting scenes to mention, especially as we get to know the characters better. One of the best involves Shukishi having a night out with some old friends. The guys drink a lot of sake and end up talking about the disappointments of their kids. It's intriguing because Shukishi still holds back from truly expressing his feelings about the indifference. He hedges on stating his true feelings but makes his point if you truly watch his face. This scene also relates to drinking problems that may play a role in the tough reactions to their parents. Since he stopped drinking when their youngest daughter Kyôko was born, she has much different feelings about them. Another highlight is Tomi and Shukishi's trip to the resort at Atami because Shige doesn't have time for them. They're happy at first to see the beautiful setting, but it seems pointless, especially while dealing with the noisy young couples there. It's a depressing scene as they realize their limited place in the lives of their children. During the first act, I wondered if this was going to be a film that didn't live up to the praise. The characters were interesting, but the slow pace made it a tricky experience. By the end of Tokyo Story, I was convinced that it deserves its place as one of the great films. It generates serious emotions, especially as we see the frustrating indifference of the self-centered children. My first inspiration after finishing this movie was to call my parents and schedule a dinner. There are parts of these characters in all of us, especially as concerns at work and home grow as an adult. Ozu strikes at the heart of this matter by showing the ugly side of the relationships. These issues have been covered by other movies, but those stories are typically on the melodramatic side. Ozu keeps the parents' disappointment beneath the surface, which makes the end result a lot more convincing. Next week, I'll head to World War II-era France and check out The Rules of the Game. I'm encouraged by this to give Tokyo Story another try. I've tried to watch it a couple of times, but always got bogged down toward the beginning. I'm more well-versed in Japanese film in general now, though, so perhaps I'll have a better go of it next time I try to watch it. Jandy, I'll admit that it's a really slow-moving film, and it's tough to get interested at the beginning. I watched it on the train, which helped a lot because I wasn't as distracted. I'd recommend giving it a shot but making sure it's at a time when you can focus. Like you mention, it's easy to get bogged down at the start. Thanks! I absolutely loved this film when I watched it last year. 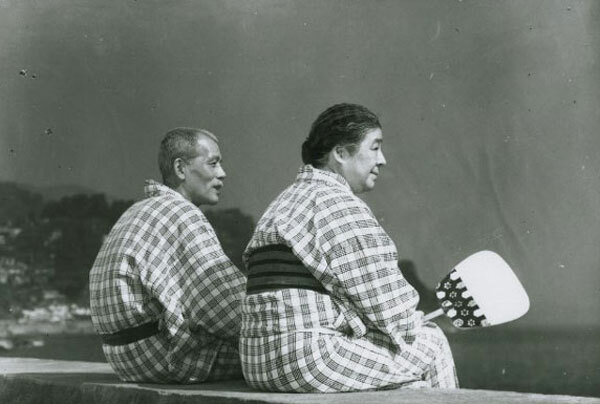 Even the way Ozu decided to film Tokyo Story was inspiring. I'm glad you got to check this one out and would recommend it to anyone. Max, I'm glad to hear that you enjoyed it. A good part of it is Ozu's style for sure. It took me a little bit to get rolling with the story, but I was totally hooked by the end. I'd been meaning to see this movie for years, so I'm glad to finally check it out. Thanks!